Schneider Children's Medical Center of Israel was inaugurated on October 29, 1991 (see milestones), and officially opened to the public in April 1992. The medical center owes its establishment and name to its founders and major benefactors, Irving and Helen Schneider of New York, USA. It was built following a comprehensive study of Israel's healthcare system and its national pediatric medical needs. The survey was commissioned by Mr. and Mrs. Schneider, who had previously been involved in the development of the Long Island Jewish Medical Center in New York, and recognized the need for a similar facility in Israel. Conducted by an international committee of experts between 1986-1988, the survey concluded that there was a critical necessity for a modern tertiary care hospital solely dedicated to children in Israel and the Middle East. The results also emphasized that a children's department in a general hospital were insufficient to respond to the special needs of children. A building with an area of about 20,000 sq. meters was originally suggested, much less that what was finally built (35,000 sq. meters). Designed by Americans Marvin Bostin, a specialist in the planning of children's hospitals and Jerry Switzer, a renowned architect, the planning of the seven-story building took about three years. Each floor comprised a central passageway, which divided the area into two main sections: hospitalization wards on one side and day clinics on the other. Mr. Schneider himself was involved in every detail from the start. Once or twice a month, he and Mrs. Schneider visited Israel to follow progress. The whole family participated, including their two daughters, Lynn and Mindy. Towards the final stages of construction, Helen Schneider became the guiding spirit behind issues of aesthetics and it is due to her elegant style and impeccable taste that the choice of materials and coloring are so unique to the medical center. Since its inception, Schneider Children's has made an indelible contribution to the healthcare of children in Israel. Through the development of the range of pediatric sub-specialties, children's departments in other hospitals have been upgraded throughout the country. In creating a hospital exclusively for infants, children and adolescents, Schneider Children's responded to a real need and adopted world standards of hospital professionalism. But its true success lies in its pioneering spirit, the quality and dedication of its staff, and the devotion of its supporters and volunteers. All these have combined to create a winning combination between medical excellence and a special environment for children. This is the core of the medical center. 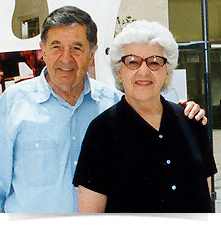 Irving Schneider, founder and major benefactor of Schneider Children's Medical Center of Israel, passed away on Friday, November 23, 2012 at the age of 93. Together with his wife, Helen, he spearheaded the idea of an independent hospital solely dedicated to children. His magnificent contribution remains one of the largest single donations ever received by the State of Israel from an individual to a public institution for the welfare of its people. Irving Schneider was a man of vision and great foresight, who fought to establish a hospital dedicated to children at a time when a significant majority of health officials in the country did not see such a need. He made every effort to ensure that the best pediatricians from all disciplines and subspecialties would work with the most advanced equipment and technologies under one roof within a unique environment created especially for children. His donation was not only a generous monetary gift, but also a contribution of ideas and values, where the child and his family were seen as one whole entity, with special needs. Mr. Schneider also promoted unique principles and ethics. Inscribed in the Foundation Scroll signed in 1988 and buried beneath the building’s foundations, is that “this hospital – dedicated to the fundamental rights of each child to live a healthy life in a peaceful world – will serve as a bridge to peace linking this nation to its neighbors”, a policy faithfully adhered to by the medical center. Irving Schneider was born in Brooklyn, graduated from Boys High School and received his degree from the City College of New York in 1939. He served as chairman and COO of the real estate concern Helmsley-Spear, Inc., where he worked for more than 50 years. He was a major donor to numerous causes. Brandeis University awarded him an honorary doctorate of humane letters in 1983. Helen Schneider’s fingerprint continues to permeate Schneider Children's beautiful building to this day with its warm atmosphere, and her spirit of giving and generosity will forever echo within its walls, carrying with it the health and the love of many children. When Schneider Children's came into being in 1991, the Schneider’s involvement did not end with their financial contribution. During the various stages of the hospital's development, Helen displayed exceptional insight. In her quiet, yet dynamic style, she contributed a sense of aesthetics, impeccable taste and sensitivity towards children's needs that are an integral part of the hospital. Helen Schneider initiated and founded the volunteer association "Yeladim Shelanu" (Our Children), to benefit children’s welfare at Schneider Children's and served as its President until her death. She was not only a devoted friend and a member of the family, but also Schneider Children's mentor in many ways. Schneider Children's would not be the popular and recognized institution that it is today had it not been for Helen Schneider's input. She was a pivotal figure during the planning stages of the hospital, always concerned with the tiniest nuances, which would affect children's emotions and feelings. She was highly respected and valued alongside her enormous caring and determination for quality and excellence - traits that epitomized her grandeur in every sense of the word. Helen passed away in New York following a serious illness on December 8, 2001, at the age of 80.